newport beach water quality report Archives - Pure Elements Water, LLC. "Custom Whole House Water Filters"
Pure Elements Water, LLC. "Custom Whole House Water Filters"
Epoxy Pipe Lining Alternative in Ladera Ranch – Pinhole Leak Prevention – Gets Results! How aware are we, and what can we do? This may seem like a strange question, but how much do we really know about the effects of bathing in water with chlorine added by our municipalities? Everyone is aware that without some form of bacteriological kill, we would suffer disease and waterborne bacteria could threaten our health. We can credit chlorine disinfection in our water, introduced in 1908, for dramatically reducing our potential for acquiring serious diseases like typhoid fever, dysentery, cholera and Legionnaires’ disease. And we appreciate the fact that chlorine is a very inexpensive chemical, even though it is classified as a pesticide that is effective in killing living organisms. However, it is not uncommon today to find levels of chlorine in our tap water that exceed those recommended as safe for most swimming pools. 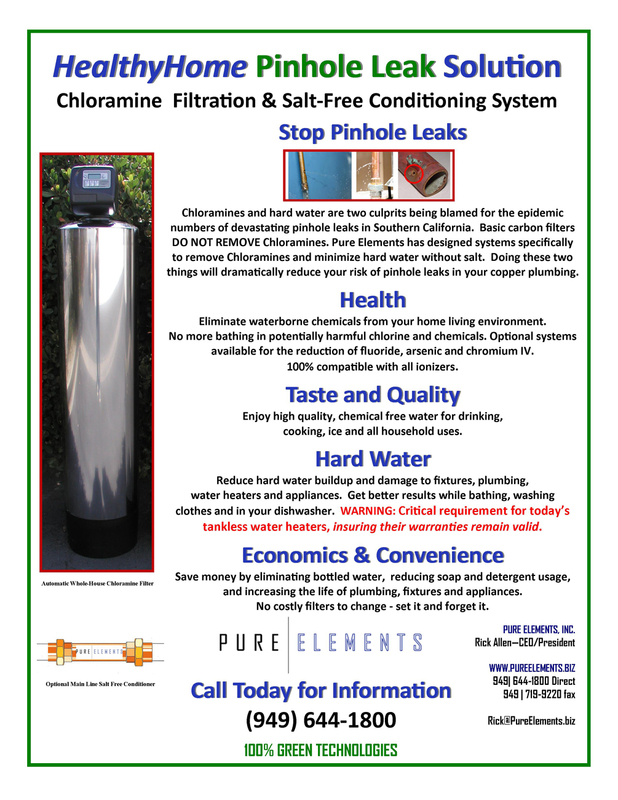 Chlorine is most effectively used when it maintains a residual until the time the treated water is ready for use. So this means we need it delivered to our front door, but should we let it into our home? I believe the answer is a resounding “NO”. Chlorine and the altered version chloramines (chlorine and ammonia intentionally mixed together) can have an adverse effect on us when we consume it. Thinking logically: If chlorine kills organisms by destroying the cell wall, what is it doing inside our bodies? Some have suggested that, if we monitor and keep the levels low enough, our bodies will simply neutralize the chlorine we ingest. But scientists agree that higher levels of chlorine introduced into our bodies have a detrimental effect on our cells, and therefore negatively affect our heath and well-being. And the jury is still out about prolonged exposure through consumption. This article, however, is not about ingesting chlorine and chloramines from our drinking water. A much greater danger lurks in our bath and shower water. There is an increased risk of cancer and other ailments caused by bathing in water treated with these chemicals. Because chlorine is a poison that kills waterborne pathogens, it has a detrimental effect on humans by attacking delicate tissues when absorbed into our skin or through respiration into our lungs. Inhaled air containing chloroform and other chlorine byproducts (such as organochlorines) can contain up to 100 times the chemical levels of the incoming water, because chemicals readily vaporize into the steam in the bath or shower. This chemical-laden steam causes harmful chemicals to enter directly into our bloodstream, rather than being processed by kidneys and the digestive system. Exposure to these chemicals increases production of free radicals, causes damage to cells, and provides prolonged exposure to carcinogens. Numerous studies over the past 50 years have shown a correlation between chlorine and serious disease, including breast, rectal and bladder cancers. Chlorine has been proven to be a contributory factor in damage to the heart, lungs, kidney, liver and central nervous system, as well as to the stomach. Other diseases connected to chlorine include atherosclerosis and respiratory problems, and some research has shown that chlorine destroys body protein. One of the newest (and most disconcerting) findings relates chlorine directly to breast cancer, which kills many women each year. One out of eight women in the United States is diagnosed with breast cancer, and recent studies conducted in Hartford, Connecticut have linked the accumulation in breast tissue of chlorine byproducts (called organochlorines) directly to breast cancer. Breast cancer patients were shown to have organochlorines levels of 50% to 60% higher than women without the disease. Chlorine and chloramines in the bath and shower also cause dry, flaky skin and increase skin-related irritations. Hair becomes dry and brittle, with increased dandruff and dryness of the scalp. Skin, the largest organ of our body, soaks up chemicals like a large sponge in an environment with warm water and steam. This phenomenon occurs because the warm temperature of the water causes our pores to become enlarged, creating sites eager to instantly absorb gaseous chemicals. Eyes, sinuses and throat tissues become unnecessarily irritated with this exposure. Chlorine and its byproducts can also be extremely dangerous to the delicate tissues in our lungs. Researchers have shown that after 10 minutes in the shower, people show measurable increases in chloroform concentrations in their lungs (averaging 2.7 parts per billion). I believe that knowledge is power, and we have taken a brief look at the threats posed to our bodies by unnecessary exposure to chlorine, chloramines and their byproducts. Armed with this knowledge, it is time to seek out a solution by taking control of the levels of exposure to these chemicals in our homes. 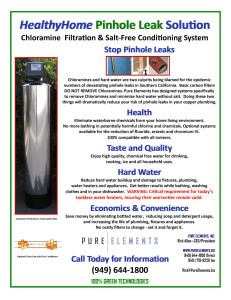 The most effective answer is to install a fully automatic, multimedia whole-house chlorine water filter at the point where the water enters your home. This allows you to maintain the disinfecting benefits of chlorine to the front door, while completely removing it from your household living environment. This further contributes to home wellness by eliminating the resultant airborne chemicals, and provides great tasting water from every faucet and to ice makers. Choose the whole-house water system not only based on performance, but also on its Green characteristics. Stay away from old-fashioned water softeners that add sodium or potassium chloride to the environment (and your drinking water). Stick with technologies that have no adverse affects on the environment, and that use no salts or chemicals in their operation. Be wary of smaller shower head and faucet mounted filters, as they will provide some benefit but act more like a band-aid. These products are flow rate sensitive, meaning they may be totally ineffective if you run your shower or faucet at wide-open levels. Moreover, the size limitation means the amount of effective filtering material is small, so regular replacement is necessary to maintain any type of consistency. These products may look slightly better than they actually work. Effective, environmentally sound whole-house technology is here, and reasonably affordable, to provide a chemical free home as it relates to water and resultant air contamination. So take control – Protect yourself and your family from the cancer risk posed by chlorine and its byproducts in your water, bath and shower. Newport Beach, CA and other Orange County cities have chlorine and other chemicals in their water supplies. 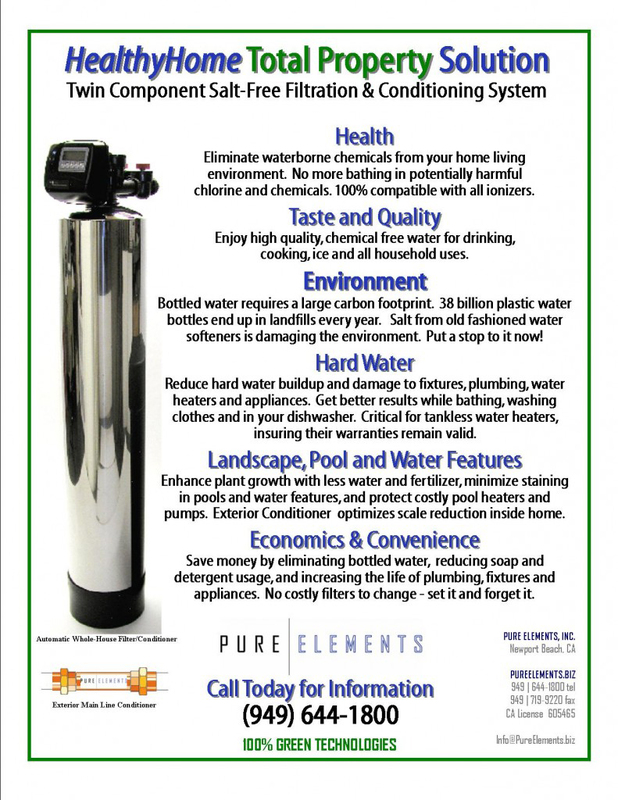 A high quality water filter is a good idea to protect yourself if you live in the area. 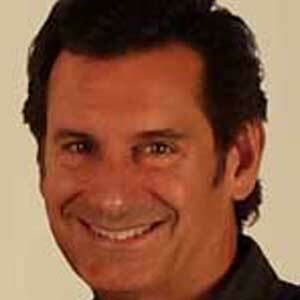 I'm Rick Allen, President/CEO of Pure Elements Water, LLC. 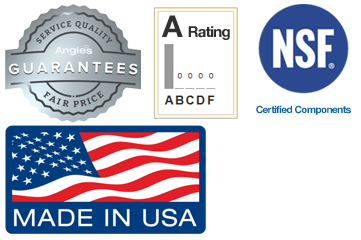 My company manufactures and installs what I believe is the finest custom water filter available. I would love to help you eliminate those problems. © 2019 Pure Elements Water, LLC. All rights reserved.